As is common now, most frameworks provide ways to make a URL shorter, more readable and more meaninful. This usually helps optimizing the ranking of the URL with search engines. In our case, using aliasing makes it possible to create even shorter calls both in Web mode and CLI mode. Obviously, in CLI mode the template is meaningless and is simply ignored. 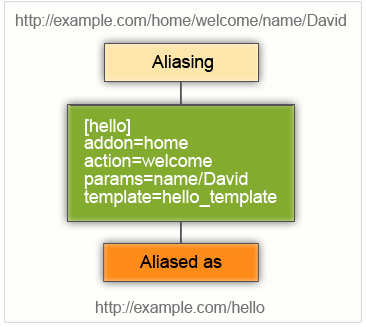 If the parameter in alias definition exists as 'name/David', and the request contains same name of parameter, then received new parameters with the same name will be ignored. In other words, parameters defined in alias are main and cannot be overriden.